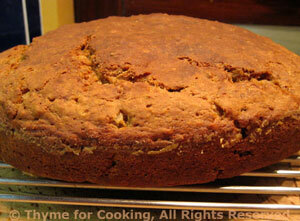 Irish Brown Bread, Thyme for Cooking easy and delicious batter bread. This is so easy, I make it often, especially in winter, to go with soup or just to have with a cup of tea on a cold wintry afternoon. Preheat the oven to 400F (200C). I use an 8.5" (22cm) round baking pan with 2" (5cm) sides for this. Butter the pan, then 'flour' it: put about 1 tbs flour in the pan and tilt the pan so that the flour covers all of the buttered area. Any excess just tip into the sink. Put all dry ingredients into a deep bowl. Add the butter and cut in with a pastry cutter, fork or 2 knives until well blended. Stir the yogurt and milk together, then stir the mixture into the flour and mix well. Pour the batter into the pan and bake for 45 minutes. Remove from oven and tip out of pan on to a wire rack and allow to cool for at least 5 minutes. Slice and serve or allow to cool completely. Note: I normally cut the loaf in half; we eat half and freeze half for later in the week. It keeps well for 3 days without freezing.